Music is one of the most appealing aspects of our worship. What a joy it is to have gifted musicians and singers volunteer to lead our worship in music. – by Rose Pruiksma, B.A., Calvin; M.A., Ph.D., Michigan. Led by a mixed instrumental-vocal ensemble (The Joy Ensemble) at Trinity we have a “choir of the congregation.” The Joy Ensemble leads the singing, but the intent is that all congregants with join in the song, as they are comfortable and able. As we go through the cycle of the church year, we change our service music accordingly. We sing a mix of traditional hymns from the Episcopal hymnal, and hymns from our “Blue Binder” collected from a variety of sources and reprinted under license. These songs come from the world church—especially those collected by John Bell—new hymns from the Iona community (John Bell)—and from the contemporary collection of hymns published as Gather by G.I.A., we also sing some hymns published by the Oregon Catholic Press. During the Eucharist, we frequently sing meditative chants from the Taizé community, or meditative songs in the manner of Taizé chants. The selection of hymns for each service involves prayerful consideration of the scripture readings for the week, the season of the church year we are currently in, and quiet meditation that allows words and tunes to make themselves heard as they are called forth by the ensemble-leader’s musical/verbal memory in response to the readings. Sometimes this response is also shaped by larger world events and our faith response to them. The process may be easy for one Sunday, and painstaking for the next. As the ensemble leader and the one who organizes the music, I realize that what we sing is shaped by my knowledge of the hymnal, of alternate resources for hymns, my own personal spiritual journey and its darkness and light, but on no occasion do I make hymn choices lightly. I am always considering multiple elements—texts, tunes, familiarity, newness, musical/textual integrity, tradition, global perspectives—when choosing the music we will sing together. All hymns will not please all people, but I know, for my own personal integrity, that all of the hymns we sing are mindfully, prayerfully selected, and it is my hope that even the unfamiliar and the new may reach someone, and that the old hymns we sing will remind us of our connectedness to those who have gone before us. When we sing the songs of the world church, even in our discomfort with African languages, we affirm our connection to the global body of Christ. We deliberately do not have a choir at Trinity, affirming the importance of the whole congregation as participants in our ongoing song, so we do not “perform” anthems. We do, occasionally, draw on our voices to act as “cantor” in leading the congregation in responsive singing. We also sometimes sing as an ensemble, an unfamiliar hymn one Sunday alone, so that in following Sundays, we can teach it to the congregation, but our function is to lead and facilitate congregational song, and through that song to express our collective joys, sorrows, hopes, fears, faith and love together as we blend our voices. 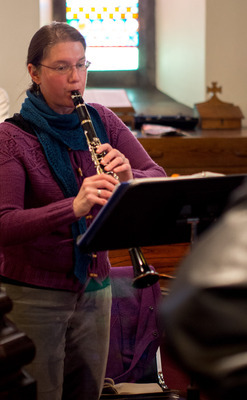 Funding for the Music at Trinity program is by the Annie Crawshaw Endowment and by the members and friends of Trinity Church.